Join me in my quest to becoming a speedcuber. A while ago, I’m estimating somewhere in November 2010, I stumbled across Dan Brown’s video tutorial on “how to solve a Rubik’s cube”. Up until that point I had never fully committed to the seemingly arduous task of completely solving the Rubik’s cube by heart,…no books, no papers, no fancy iPhone apps, or video tutorials guiding you through the various steps…just a man and an unsolved Rubik’s cube magically transforming into a solved Rubik’s cube before your very eyes. It seemed like something only truly gifted mathematician-type people were capable of…just way too abstract and complicated for me. In any case, all the self-doubt and fear of failing aside, Dan Brown’s contagious enthousiasm won me over in a big way, and I decided to dig up my old Rubik’s cube, which in the mean time had ended up in my 2 year old son’s toy basket. It took me roughly a day or two to decipher and piece together his somewhat hyperactive online instructions, but before long, I had made my own summary of “his” method with everything neatly written out so as to perfectly understand every step. The first time I attempted to actually solve the cube with my piece of paper, it took me roughly 23 minutes, as I learnt how to hold the cube properly, how to read cube notation, and how to perform the algorithms without messing everything up. 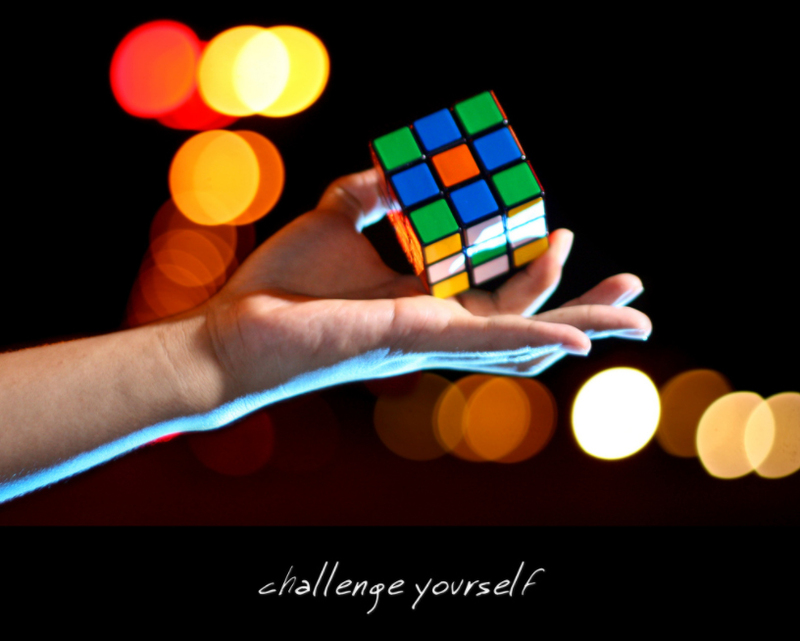 It was a long, slow process,…but when I finally ended up with my very first solved Rubik’s cube, I was ecstatic. I had finally tapped into the mysterious world of Rubik’s cubing. Three days later, I had learnt all the necessary algorithms by heart, (9 in total), and could solve the Rubik’s cube in roughly 6 minutes. From this point on, it became more and more of a challenge to work on speeding up the time it took to solve the cube, working on things like positioning and using my fingers more efficiently, and implementing 1 or 2 “short-cut” algorithms. After a week or two of cubing, I was averaging around 3 to 4 minutes for a complete solve from any random position, (colour neutral solves as it’s referred to in Rubik’s cube jargon), using my original Rubik’s cube. I tried lubricating my original Rubik’s cube with vaseline as Dan Brown had suggested in another video (http://www.youtube.com/watch?v=81ng6qGZGpE), which did markedly improve the speed with which the faces of the cube turn, but it still didn’t move anywhere near as smooth and silky as some of the cubes I had seen on youtube. 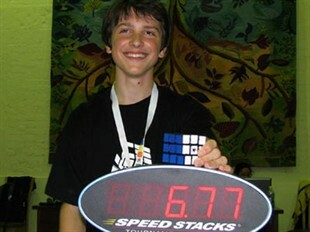 I would say that lubricating my original Rubik’s cube with vaseline shaved roughly 30 seconds off my time. I ended up buying all 3 cubes for just under $43. Eight dollars for the F-II, fifteen dollars for the Guhong and twenty dollars for the Haiyan Memory, which I found painfully expensive when compared to the F-II for instance, but still extremely cheap when you consider the initial investments of some of my other hobby’s like music, or golf, or photography. The delivery of ea ch cube following my online order was a true revelation for me. 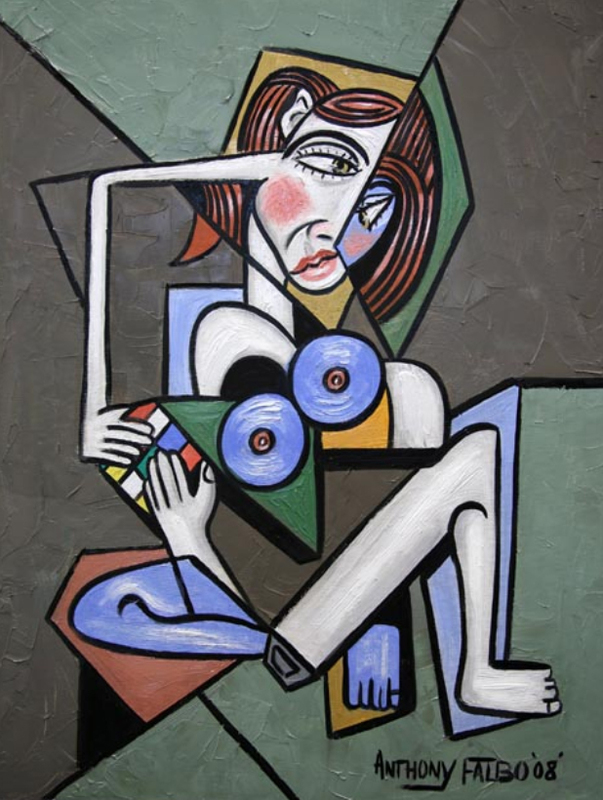 The “F-II” arrived first, and just blew me away completely, especially considering I had, in the mean time, spent roughly 3 weeks fidgeting with my original Rubik’s cube. By this time I could execute my algorithms fluently, and my fingers were warming up to the different movements of the cube, but I still couldn’t manage to solve the cube in under 3 minutes. In my very first halfhour session with the F-II, the day it arrived in the mail, I was averaging around 2 minutes. This new super cube had cut an entire minute off my average time per solve. 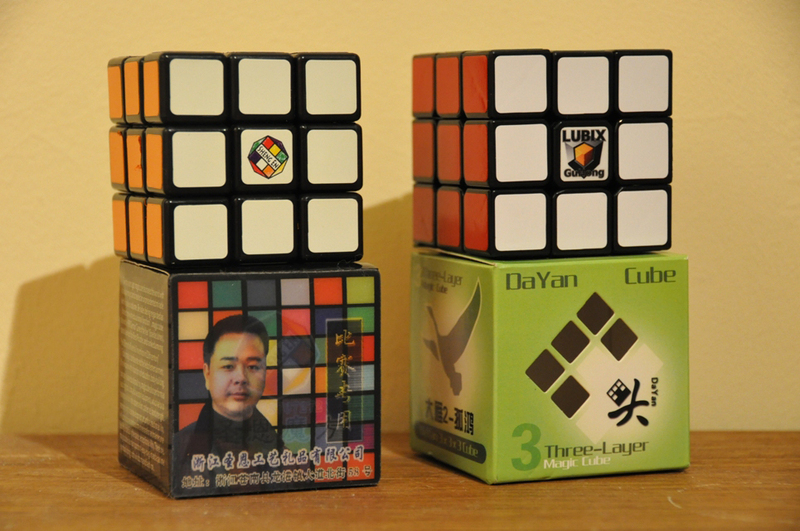 I was a little less excited with the arrival of the “Guhong”, but only because it’s just too fast for my level of cubing, especially considering I still only use the beginner’s method as taught by Dan Brown. By ‘too fast’, I mean it’s just downright slippery to hold and turn with my fingers, which often results in me overturning the faces, and losing momentum. 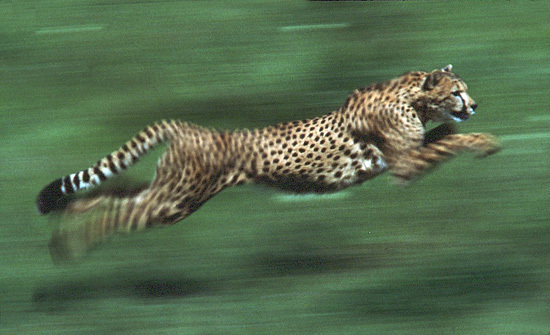 This is definitely a R ubik’s cube cheetah that just wants to hit full flight the minute one of it’s faces is even slightly turned. No room for hesitation, or unnecessary steps. It’s a good thing I did order another one, because literally 2 days after it arrived in the mail, I read reports that the Guhong is no longer available for purchase due to a patent violation. The Haiyan Memory cube has yet to arrive (extremely slow shipping from CubeDepot), but I hear it’s also one of the very best cubes on the market with numerous world record times to its name. So, my main cube at this stage is without a doubt, the F-II. It’s just an incredibly awesome cube for beginners looking to make the transition between merely solving a cube regardless of how long it takes, and speedcubing. It’s an incredibly forgiving cube, urging you on to making your turns just a second or two faster. Using Dan Brown’s beginner method, I’m now averaging 1’30” for my solves (my personal best is 1’12”), which is clearly staggering to every single one of my friends, colleagues and family members. 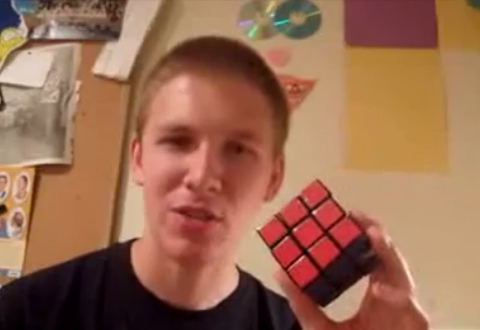 Reactions to me solving the cube under a minute and a half have been so awesome, surprising even, because I’ve spent countless hours watching vide o’s on youtube of guys like Feliks Zemdegs solving the cube in less than 7 seconds, so when seen in that light, 1’12” didn’t initially seem like a huge accomplishment. I’ve since grown quite proud of my best time, and progress in general, and realise that there are just too many steps in the layer-per-layer beginner method to cut my time substancially anymore. I reckon that if I had the perfect solve, without any hesitation, without any errors and with a bit of luck, I could get my time down to just over a minute…and that would be ridiculously fast to run through all the steps required in the beginner’s method. 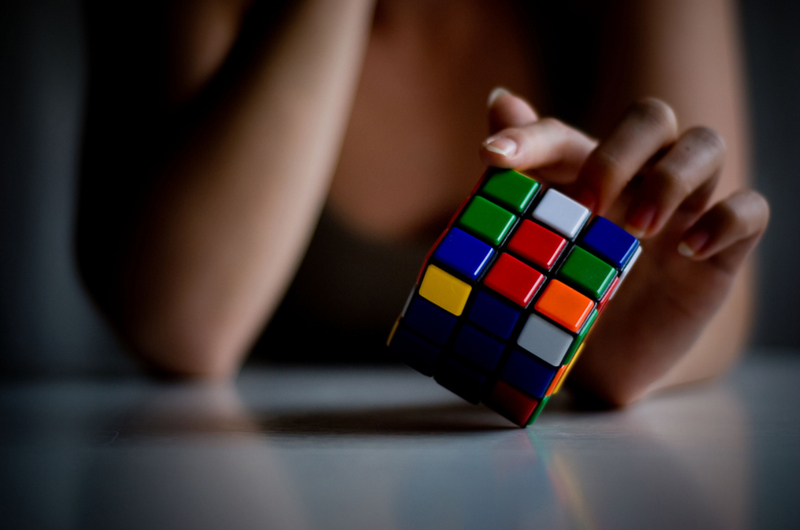 If I’m serious about solving the Rubik’s cube in under a minute, which I am, I’m simply going to need a new approach, a new, more complex, more dynamic method. The thing is, once you’re solving the cube in under a minute and a half, using the beginner method, you intuitively feel that you could be posting much better times, if a more efficient method was used, because the fingers are pretty much moving as fast as they can, and yet your time stagnates at just over a minute. That’s the main reason I’m starting this blog. At this point, I know next to nothing about how to most efficiently, and most effectively solve a Rubik’s cube…so I’m going to use my blog as a journal to document my progress into the world of speedcubing. It will also hopefully serve as an extra motivation for me to battle through the obstacles of climbing what I assume is going to be a pretty steep mountain, as I make my way toward solving the cube in 30 seconds or less. When you consider that the world record for solving a Rubik’s cube in 1981 was 38 seconds (of course the cubes back then were mechanically far inferior), you realise just how fast a 30 second solve is. Another added bonus of this blog would also be to hopefully serve 1 or 2 readers as a companion or guide on their roads to becoming speed cubers themselves. I’m going to commit one year to the cause, and assess the situation from there, see how far I get in achieving my goal, which at this point is to one day post a video of me solving the Rubik’s cube in under 30 seconds, carving a minute off my average solve time as it stands today. My next post will be a breakdown of Dan Brown’s (or is it officially Dan Knights’?) beginner method, using the summary I made of his video tutorial as a foundation. This entry was posted in 2010 and tagged 3x3x3, algorithms, alpha, beginner's, brown, caitlin, chris, cube, cuber, cubing, dan, dayan, diary, en, erno, F-II, feliks, guhong, haiyan, knights, lubix, memory, method, morton, pogobat, rubik, rubik's, sheng, solve, solving, speedcubing, tutorial, type, ultimate, v, video, world record, zemdegs. Bookmark the permalink.